Cork, 5th May 2017: Innovators and entrepreneurs will benefit from a new phase of the SPRINT accelerator, announced today (Friday) by UCCPresident, Prof Patrick O’Shea at Gateway UCC. SPRINT II has already signed up 12 early-stage startups, including one which offers technologies for constant monitoring of brain health for at-risk newborns and a new diagnostics platform for IBS (irritable bowel syndrome), which is the most common gastrointenstinal disorder affecting over 40 million people in Europe alone. As well as med-tech innovators, SPRINT II participants are also commercialising solutions in renewable energy (both hardware and software), data analytics, emergency management and scientific instrumentation among others. Success stories of 2016 SPRINT programme were recognised at the launch of the next round of the accelerator. 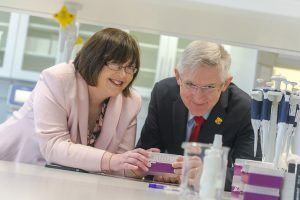 UCC President Pat O’ Shea presented the “Sprint’s Most Investible Start Up” Award 2016 to emerging medical device company, Skellig Surgical, which focuses on development of user-centred, minimally invasive technology. The UCC President also presented the “Sprint’s Most Revenue Generating, Market-Ready Award” to Food Choice at Work, which delivers the ultimate healthy eating management system in the workplace. Both companies are resident in Gateway UCC and together they employ 12 people currently.